Serving all of Southeastern Colorado since 1970! Spaccamonti Excavating, LLC is looking to hire heavy equipment operators and laborers. Competitive wages, health insurance, vacation, drug free environment. Must pass background check. To apply, go to our career page and download the application form or come by our office. 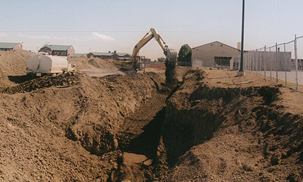 At Spaccamonti Excavating, LLC, customers can rely on first-rate expertise on all residential and commercial excavating jobs. We ensure loyal services when completing your project. Contact us today! We have highly-qualified professionals capable of installing durable water main and sewer utilities for any residential or commercial customer. Let our friendly crew install your utilities today! Spaccamonti Excavating LLC, a registered Wyoming Corporation, is a general contractor specializing in site work and utility installation. We have been in business since 1970; and have successfully completed thousands of projects. Our experienced work force has enabled us to maintain a superior quality of workmanship with many repeat customers. Our capabilities range from utility line installation, road construction and repair, land leveling and site grading for industrial, commercial and residential construction, as well as directional boring, soil remediation and erosion control, to above ground and under ground storage tank installation and removal, building demolition and railroad car derailment salvage. 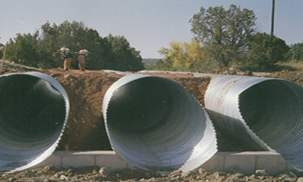 Spaccamonti’s experience includes large complex water, storm sewer and sanitary sewer line installations as well as quick response fuel spill clean ups. Spaccamonti currently has six (6) people trained and designated by the company as Competent Persons in Excavating and seven (7) people that are 40 hour Hazardous Waste Operations Technician (Hazwopper) certified. We have been in business since 1970 and have successfully completed thousands of projects. Our experienced work force has enabled us to maintain a superior quality of workmanship with many repeat customers. © 2019 Spaccamonti Excavating, LLC. All rights reserved.